Photo credit: jriede, CC BY 2.0. MEGAN: Happy Friday! Any weekend plans? NICOLE: I have my second (and I assume final) driving lesson! I think the teacher would have let me “pass” after the first lesson, but I paid for two, so we’re doing two. Turns out driving a car is pretty fun! MEGAN: Ha! It is really convenient and is often more fun than public transit. NICOLE: I’ve had plenty of fun on public transit! You can listen to podcasts! I guess you can do that in a car too. MEGAN: I’m thinking about getting rid of my car. NICOLE: What are the pros/cons? MEGAN: Pros: owning a car stresses me out because it’s so involved. A ton of ongoing responsibilities (getting oil changed, getting general repairs, getting annual parking passes, getting insurance) and ongoing bills (all those things, plus paying for parking at my apartment and more). I’d like to free up some mental space and be unconcerned with it. Also a pro: I barely use it. I thought I’d need it more for my new job, but I’ve only needed it 3–4 times in the last eight months. Every other drive I’ve taken was something like a quick 2-mile trip to Target (on public transport). Cons: inertia. Getting rid of a car is more of an upfront hassle than just keeping it (should I do any repairs before? where should I look for information on how to sell it?). If I need a car in the future, it’s probably cheaper to keep this one for a while than to buy a new (used) one in 2–3 years. NICOLE: Oooh I didn’t even think about the “should I repair my car before I try to sell my car” factor. MEGAN: They told me two months ago that I needed new brake pads, and I plan on doing that with my tax return. But then if I do it, do I really want to sell it right away after putting more money in? NICOLE: Aren’t there places that’ll buy used cars as-is? MEGAN: Probably! But that’s some research I haven’t done. I’m a dillydallyer. I don’t get the impression you are. Last fall I went on a first date with someone who said he was thinking of selling his car and on our second date he had done it. I was shocked: only a week between thinking about it and then having done it! NICOLE: HAHAHA yes that’s exactly how I’d handle something like that. MEGAN: You are very inspirational. I don’t know if it’s transformed into motivational, like I am not necessarily taking a lot of steps because of the way you do things, but I feel inspired that I could/should. NICOLE: I have a very long list of items that I have been procrastinating on, though. I don’t do everything. I still haven’t set up a tooth cleaning, for example, and that’s been on the list for a year! MEGAN: I need to too, LOL. My uncle is a dentist and so he’s always cleaned my teeth. When I’ve gone to anyone else, it’s felt like a scam — they find more cavities than he does. It’s also a good reason to go back to my hometown twice a year and see family. NICOLE: That is a good reason! MEGAN: How are you liking being closer to home? Are you picking up any childhood routines or anything? NICOLE: This was never my childhood home, so recreating childhood experiences isn’t a factor (I grew up in rural Missouri, and my parents moved to Iowa after I graduated from college). MEGAN: it’s really charming you already call it your adopted hometown! What about you? I haven’t asked about your weekend plans! MEGAN: I am going to dye Easter eggs for the first time tomorrow night with a friend and probably get wine drunk and watch bad romcoms. On Sunday I’m going on a second date to a botanical garden. NICOLE: That sounds like a lot of fun! I hope you enjoy the Easter eggs. 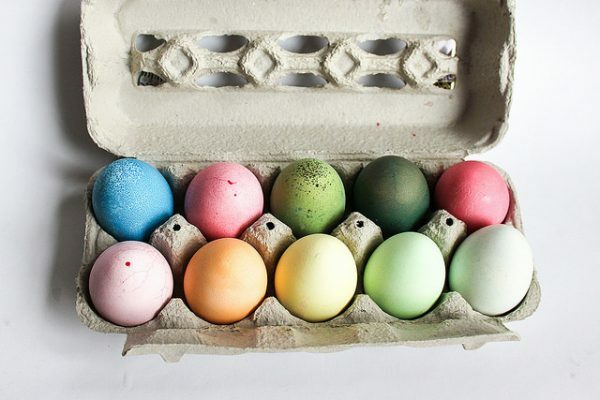 I have so many memories of dyeing eggs with those little PAAS color packets. Also not knowing how to pronounce PAAS. MEGAN: Oh, that reminds me, I’ll also be watching college basketball (Purdue has a star whose last name is Haas). How long does the easter egg thing take? NICOLE: It’s like painting your nails: a few minutes to color and a very long time to dry, and if you touch them too early you’ll smudge them. MEGAN: Gotcha. That’s also a good reminder to bring nail polish to our “crafting/movies” night. NICOLE: I just Googled “color easter eggs with nail polish” and Martha Stewart has a whole article on how to do it! MEGAN: Wow, awesome! I never would have thought to Google that. NICOLE: Google has an answer for everything — though not necessarily the right one. MEGAN: I might also see Love, Simon tomorrow. I have MoviePass, so I see most things that aren’t gory. NICOLE: I’ve heard so many good things about both Love, Simon and MoviePass. MEGAN: Good! I worried it was going to be a little too white/suburban, but no one is really complaining about that. Are you planning on doing anything for March For Our Lives? NICOLE: I hadn’t heard anything about local happenings, but I’ll check. [Update: there will be a march, and I am now planning to go.] I hope you enjoy your movie and your egg dyeing and your botanical gardens, and if you want to ask The Billfold commentariat for advice on selling your car, I’m sure they’ll have plenty to provide! MEGAN: Ahhh so overwhelming to think about! I forgot we started by talking about the car. I’d rather thing about eggs and movies and dates. Have fun with the Follies! Get footloose!